And before God created rock 'n' roll, he said, "Let there be lute songs." Lute songs, which were being written back in the early 1600s, are the true precursors of rock music. They were just simple strophic songs, meaning they were just songs with several verses of lyrics. 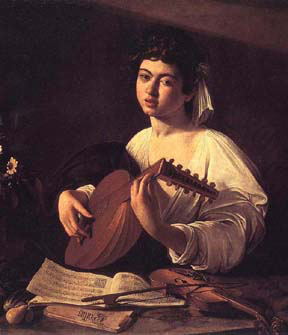 If you don't know what a lute is, here's a picture of one being played by a young lady. Of course, the lute might be played by a man too. It was a popular way for guys to entertain their girlfriends. What lady couldn't resist a handsome young man asking her, "Want to come over and I'll show you my lute?" Then she would respond "I'll show you mine if you show me yours." Of course, the idea of romance played directly into the hands of Renaissance composers in England. Some of the most popular composers of lute songs were people like John Dowland, Philip Rosseter, Frances Pilkington, Thomas Campion, and Robert Jones, to name a few. Their songs range from happy tunes to extremely melancholy ones that pondered the pains of being in love. You've already heard a lute song by John Bartlett if you examined Recess No. 3. Renaissance people had to be light-hearted, after all there was no electricity. Thomas d'Urfey, who lived in the late 1600s put together an equally light-hearted volume of lute songs known as Pills to Purge Melancholy, and it was quite a popular publication. 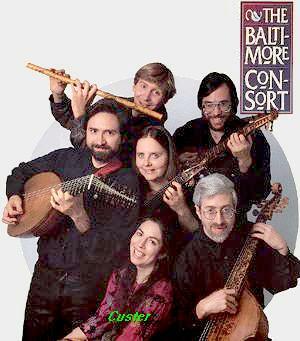 Here's an energetic lute song that has been expanded as far as accompaniment to include a few instruments in addition to the lute; It's called The Irish Jigg, and you'll hear Custer La Rue and the Baltimore Consort. She's the one at the bottom of the picture. The lute player is on the left. Listen!